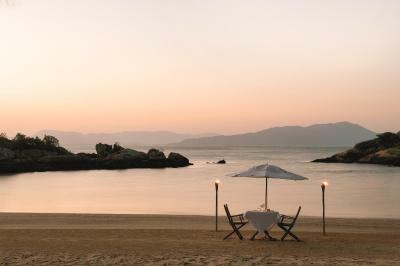 Lock in a great price for Ponta dos Ganchos Resort - rated 9.6 by recent guests. JUST PERFECT ! One of the best hotel I’ve ever been. Remarquable!!! We had the most incredible stay at Ponta dos Ganchos. We went as a really special treat for our honeymoon and would highly recommend it. Our whole time there felt special from start to finish. All staff go above and beyond to make your stay special, and the place is incredible - from the 8 course tasting menu for breakfast with hummingbirds flying past as you watch a stunning bay to the private beach to the wonderful restaurant. We were very lucky with the weather considering it wasn't peak season (though with a private cinema and indoor pool, I'm sure we would have found plenty to do if it was raining), and had the place almost to ourselves during a mid week stay in April. Ponta dos Ganchos Resort is located in a marvelous place, being that said, all you can expect about the surroundings, the silence and nature is already granted. What impressed me the most - for there are many reasons - is the calm and absolute awareness of their staff. Me and my family (girlfriend and parents) were always treated with the utmost respect and availability in a welcoming way. To me, the stay at Ponta dos Ganchos Resort has raised the bar as to what concerns Service. Of course, some things are expensive to maintain but the main thing is the amazing capability staff has to be there and serve in a joyful but tranquil manner. Simply outstanding. Achei tudo o máximo. O hotel é um luxo, muito confortável, a comida excelente e o café da manhã a la carte . Frühstück ein Fest! Personal super ausgesucht und weit über normalem Niveau in Brasilien. Wald und Berge kommen bis an den Strand herunter. Idyllisch. Foi tudo muito bem da chegada à saída. Comida ótima, pessoal atencioso, bom número de atividades a serem feitas. Os 3 melhores dias de férias de nossas vidas. Os preços são compatíveis com um local exclusivo dessa categoria. Tudo foi maravilhoso, o que falta são atrações, ex: uma musica ao vivo a noite. O enquadramento paisagístico é lindo e alguns funcionários, nomeadamente no restaurante, são top. Mas só paisagem é pouco para um resort exclusive, que está muito longe de ombrear com os melhores deste segmento. Atendimento diferenciado, o Ponta dos ganchos faz você se sentir único. 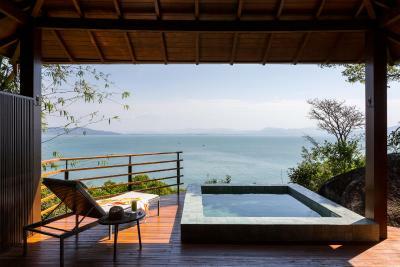 Acomodações excelentes, bangalô amplo com jacuzzi e piscina externa. Limpeza irretocável, as camareiras limpam o quarto todas as vezes que nos ausentamos. Café da manhã com Menu degustação excelente. As refeições que são servidas no restaurante frente à praia também são excelentes, destaco a atenção de toda equipe, especialmente do sommelier German e da garçonete Danielle. O atendimento quando estivemos utilizando a área da praia também foi ótimo, contando sempre com a simpatia do Bruno. O nível de excelência de toda equipe, desde do Transfer do aeroporto, check-in/out, restaurantes, camareiras, fazem da experiência Ponta dos Ganchos uma experiência única. O hotel é lindo . Fomos muito bem atendidos O ponto alto é a gastronomia. 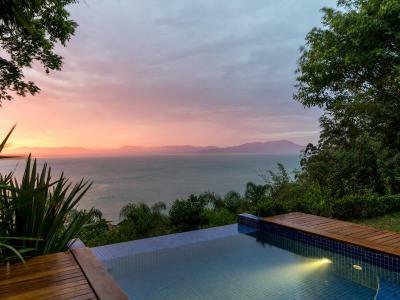 One of our top picks in Governador Celso Ramos.Overlooking the gorgeous Brazilian Emerald Coast, this resort features beautiful sea views and a private island for guests. It offers a pool with panoramic deck, gym, spa, restaurant and several activities. Wi-Fi is free. 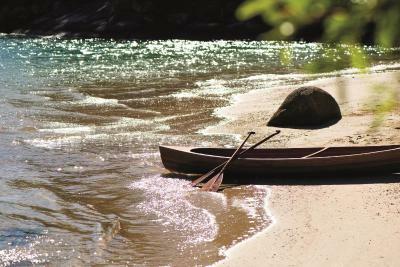 Activities include helicopter tours, snorkeling classes, hiking and kayaking. There are electric cars for guests to move around Ponta dos Ganchos. Those staying indoors can enjoy a selection of 300 DVDs to watch. Featuring a balcony with stunning sea views, units at Ponta dos Ganchos Resort come with air conditioning, an LCD TV, DVD player, spacious living area, minibar and telephone. Some units have a mini wine cellar, Nespresso coffee machine and a hammock. Other units have a hot tub and sauna unit. Governador Celso Ramos town is located 2.5 miles away. Florianópolis city centre is 24.9 miles from this resort. The popular Jurerê Internacional Beach can be reached in 50 minutes by car. This property also has one of the best-rated locations in Governador Celso Ramos! Guests are happier about it compared to other properties in the area. 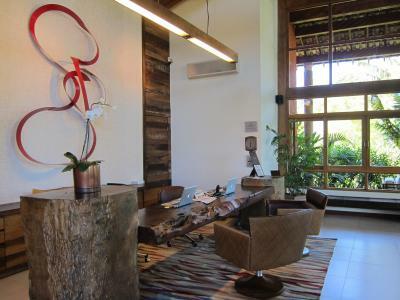 Ponta dos Ganchos Resort has been welcoming Booking.com guests since 29 May 2013. 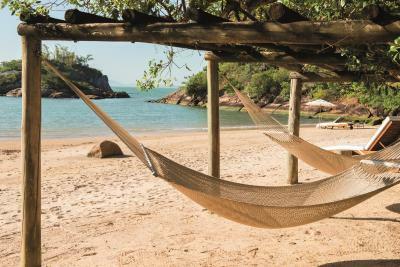 When would you like to stay at Ponta dos Ganchos Resort? With a balcony and sea views, this bungalow features a Nespresso coffee-maker, wine cellar and a bed with 300-thread count Egyptian cotton linen. Included in the room rate, guests can enjoy a welcome drink and fruit basket. With a balcony, dry sauna and plunge pool, this bungalow features a walk-in closet, Nespresso coffee-maker, wine cellar and a bed with 300-thread count Egyptian cotton linen. With a hot tub, dry sauna and private pool, this villa features a Nespresso coffee-maker, wine cellar and a bed with 600-thread count Egyptian cotton linen. With a private garden, private pool and hot tub, this villa features a Nespresso coffee-maker, wine cellar and a bed with 300-thread count Egyptian cotton linen. 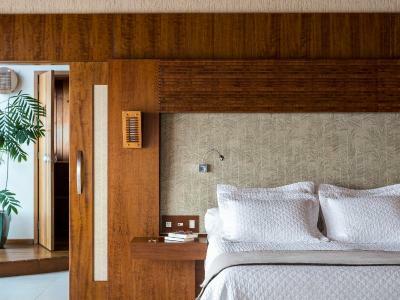 Boasting a sauna and hot tub with sea views, this villa features a private pool, coffee-maker, wine cellar and a bed with 600-thread count Egyptian cotton linen. There is a dry sauna with sea views, a spa area with massage mats and a relaxing bath spa. Boasting stunning views, as well as private gym and pool with chaise loungers, this spacious villa features a walk-in closet, coffee-maker, wine cellar and a bed with 600-thread count Egyptian cotton linen. There is a dry sauna with sea views, a spa area with massage mats and a relaxing bath spa. House rules Ponta dos Ganchos Resort takes special requests - add in the next step! Ponta dos Ganchos Resort accepts these cards and reserves the right to temporarily hold an amount prior to arrival. Nothing - our stay was perfect.